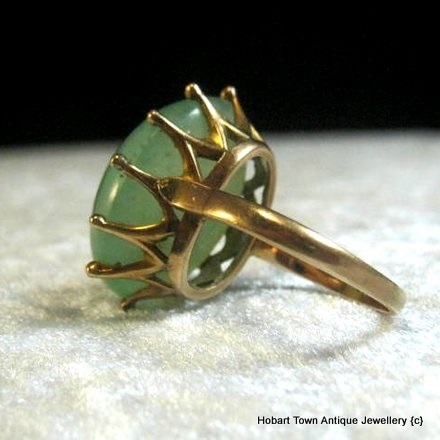 This Vintage Huge Jade ~ Jadeite Gemstone 1960 14kt Gold Cocktail Ring is a fantastic quality example of its genre. 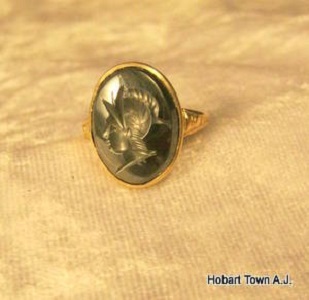 Superior quality Jadeite & quality mount. 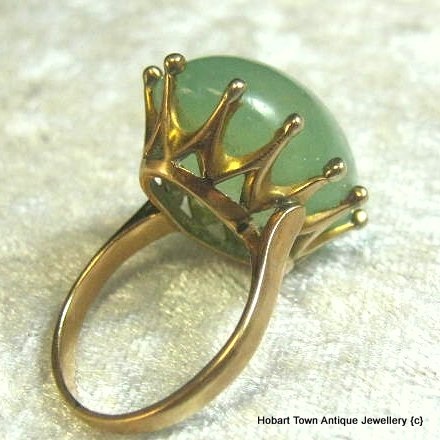 What an attractive Vintage Huge Jade ~ Jadeite Gemstone 1960 14kt Gold Cocktail Ring this one is! 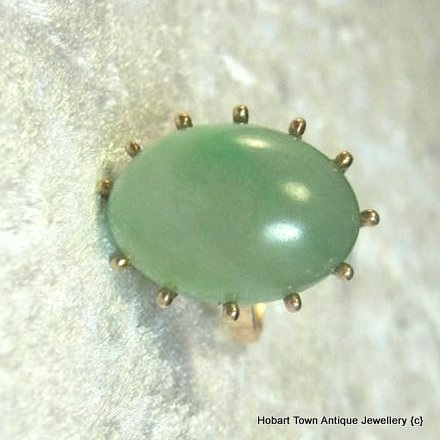 With a superior quality natural Jadeite cabochon with particularly good colour , transparency & evenness of colour. 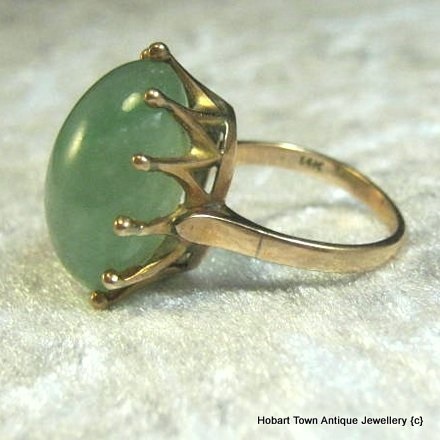 This vintage Huge Jade ~ Jadeite Gemstone 1960 14kt Gold Cocktail Ring dates from the 1960s yet remains in fine original condition. 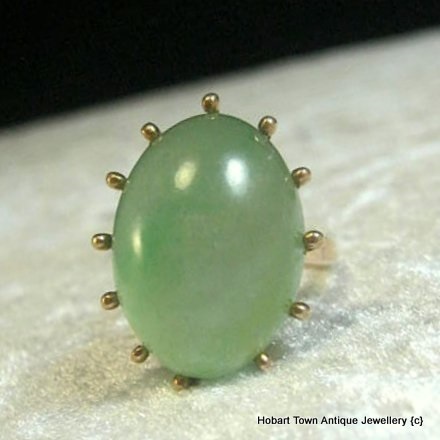 With natural Jade or Jadeite supposedly symbolic of energy and beauty, and the traditional and the modern are combined in jade in a particularly harmonious way. In ‘gemstone therapy’ it is said that jade ‘stimulates creativity and mental agility on the one hand, while also having a balancing and harmonising effect.’ So this beautiful gemstone brings us joy, vivacity and happiness ….. all at the same time …. and in the 21stC , what could we possibly need more! 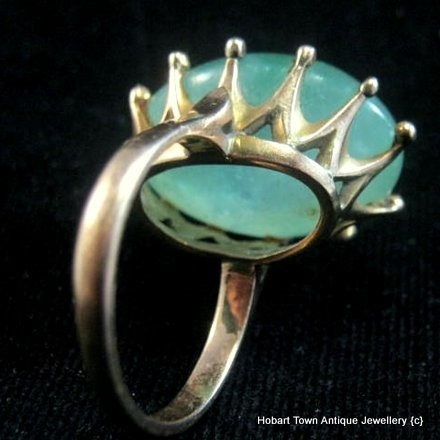 These 14ct gold coronet or crown mounts are not often “well executed” for some reason , with most that I have seen not “getting it right” , poor proportions &/or design. The craftsman who created this beautiful example most definitely knew what they were doing & definitely got it right. 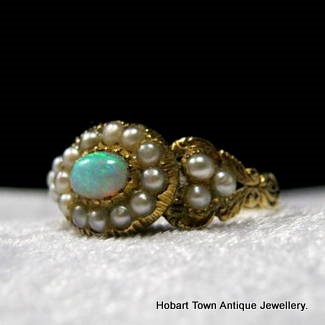 Beautifully designed , beautifully made , with a fantastic patina that has developed over its lifetime & remaining in excellent original condition ~ the ring itself ticks all of the right boxes. 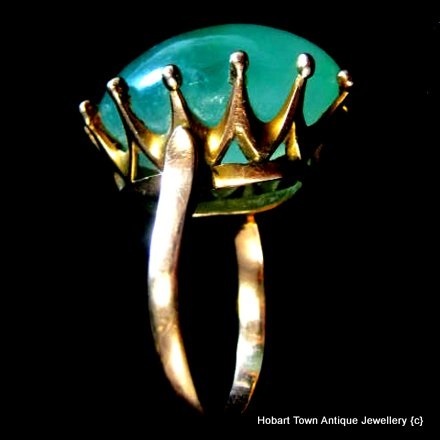 Then we move onto the outstanding , natural & Huge Jadeite gemstone. A superbly cut cabochon cut gem of very large proportions. 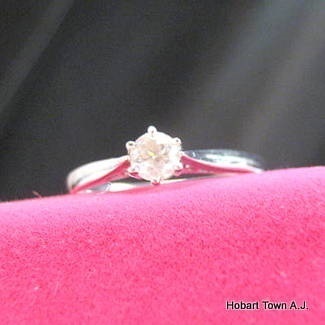 The size of the gem is not the only Huge aspect of this ring. 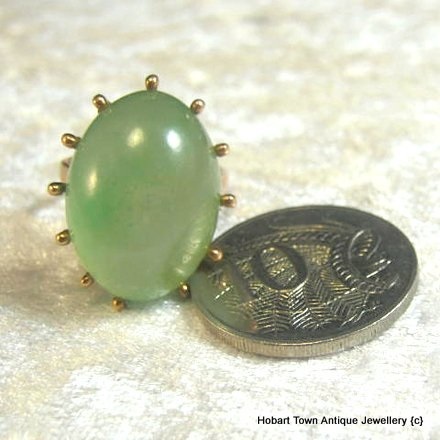 The colour , cleanness & transparency of this superior quality jadeite cabochon are well above average also! 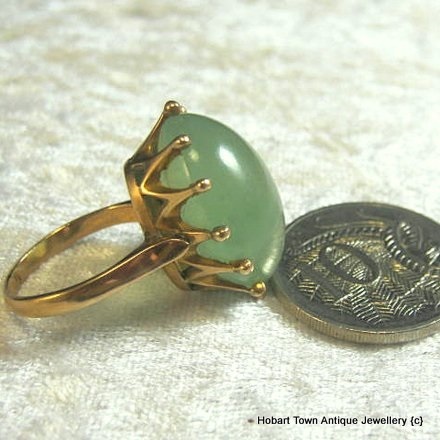 Size & measurements to follow shortly yet be assured , this very attractive Vintage Huge Jade ~ Jadeite Gemstone 1960 14kt Gold Cocktail Ring is offers value for money.